Cooler With Wheels is very convenient if you have a heavy load of food and drinks. It’s very versatile and it’s great for camping trips, family picnics, outdoor concerts or tailgate parties. Most coolers on wheels have all-terrain wheels with carry handles or retractable tow handles that can pull easily even on rough terrain. They come in different sizes and materials. The most common type is the ice chest coolers, but the smaller soft-sided coolers on wheels are gaining popularity. The large 100 quart coolers can keep ice up to 5 days even in 90 degrees heat, and carries up to 160 cans of beverages. The two major name brands are Coleman and Igloo. 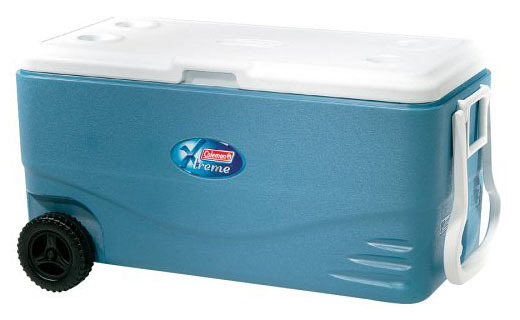 Coleman coolers are generally very reliable, and Igloo coolers are a little cheaper. is a very unique soft picnic cooler for four that has lots of room for drinks and food. It has separate compartments to keep food and drinks divided. The Eco Cooler with Wheels is equipped with removable wheeled cart with retractable handle. It also Includes a hand grip, adjustable shoulder strap and extra front pocket.